After the physical difficulty of the Baltimore Marathon, my quads and Achilles were shot. Naturally I chose to spend my Sunday traipsing all over Busch Gardens Williamsburg. Honestly it was probably good for me to keep myself moving and stretch out my muscles, and anyway we had an awesome time. And with a half price Groupon, why not? BGW, for those unfamiliar, is themed to the various countries of Europe (mostly; New France, how'd you get here, eh?). The entry area is England (the "Main Street USA" if you will) followed by a Scotland hub. It was here I enjoyed the highlight of the whole day: I PET A BORDER COLLIE. Her name was Daisy and she was the sweetest and YES I would love an amusement park that was nothing but cuddly animals please build that for me. ... And over to France for Pat's favorite coaster in the park and possibly the world, Griffon. It's a dive coaster with a vertical drop of over 200 feet, and riding in the front row is mandatory. Next up was Apollo's Chariot, my favorite coast in the park (but not the world). This coaster is so smooth and full of air time that riding it is almost soothing. I love the bunny hops at the end! Finally we took a couple spins on Verbolten, the most Disney-esque ride in the whole park if you ask me. It's barely more than a kiddie coaster but the queue is elaborately themed and the coaster itself features a show building with a vague storyline. It's kinda crazy how slow it was in the off season - by noon we'd taken multiple rides on all the coasters we cared about. We spent the remainder of the afternoon wandering around, poking around in shops, having a couple drinks at the pirate bar in the Italy area, and occasionally taking in an additional coaster ride. We had lunch at the Squire's Grille, which seems to largely fly under the radar. The fare is simple - burgers and chicken nuggets and the like - but honestly it was better than any of the Festhaus or Trapper's Smokehouse offerings. If you're just looking to get some food in you with a minimal wait, I'd highly recommend it. The Howl-O-Scream crowd started rolling in around 2pm, so we took in some shows instead. The More Pet Shenanigans show was cute and of course the animals were adorable, but the acting was pretty cringey. I wish they didn't act at all. As for the new predator show, it's... largely the same, if you ask me. They've rearranged things a bit and the dialogue's been tweaked but, again, ENOUGH WITH THE ACTING. Just present the animals already! We were both pretty tired by that point and Pat wanted to go grocery shopping that night, so above my feeble protests he led me out around 5pm. So we missed all the Howl-O-Scream stuff. But I hate haunted houses so whatever. If we go again next year I'd like to check out some of the Terror-tories, though. This is the fourth time I've recapped a day at BGW on this blog, and I worry sometimes that it's all too repetitive to be worth posting. And I rarely have many pictures because of BGW's no bags on rides policy; my phone (and everything else) is shoved in my bra most of the day. It was our second ride on Griffon. As we surged down that first, massive drop something hit me in the teeth and lip and then just hung there. The coursing wind quickly blew it off but I was bothered the whole rest of the ride - what WAS that? Pat was quite convinced it was a bug. Okay, that's a story of sorts in an of itself. But it got much more interesting when we noticed on subsequent rides that there are wasps ALL OVER the track of the first hill. So PROBABLY I killed a wasp WITH MY FACE. 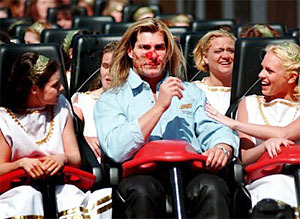 And we all know what that means: I AM JUST LIKE FABIO. Have you ever been to Busch Gardens Williamsburg? Have your ever killed a bug with your face? I think Verbolten is my favorite! But Busch Gardens Williamsburg has so many good coasters. I was finally brave enough to ride Griffon in the front row last time we were there! Front row on Griffon is SO. AMAZING.